Do your legs hurt after sitting for too long? Do your leg joints often feel cold? Do you have any problems with your legs? These are probably all knee problems. Say goodbye to knee problems, this PMA Graphene Heating Knee Pad is a good assistant. Graphene heating creates far-infrared waves of life that are similar to the wavelength of the human body and can effectively remove harmful substances from the body. It is suitable for the elderly, sports talents and people with knee injuries. - SBR fabric has super flexibility, and the soft shape that fits the knee well. - Three levels of temperature can meet different needs easily. - With the simple button, you can adjust the temperature level conveniently. - It can also be used with wormwood bag, more practical. - Graphene can continue to heat up and give you great care. 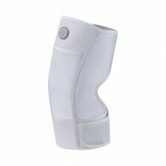 - The popliteal fossa part adopts the hollowed-out diamond design, and the knee can be bent at will. - The output voltage is lower than the human body safety voltage (36V and less), it can be used safely. - The first time it is used, there is no need to wash with water. - This product needs to be used with external power supply or power bank. - Wash by hand if water washing is needed. - The water temperature is not recommended to exceed 30 Deg.C. - Dry it naturally. Please do not use the drying device to dry the knee pad.